This week saw the conclusion of the UN Committee Against Torture’s review of Sri Lanka, a regular process of expert-based scrutiny designed to monitor implementation of the Convention Against Torture. The meeting, held in Geneva between members of the Committee and a Sri Lankan delegation, followed a series of written submissions to the body made by both the government of Sri Lanka, the National Human Rights Commission, and various civil society organisations (all available here). After the damning verdict of the Committee at the last review in 2011, the latest meeting offered the new government of Sri Lanka a major opportunity to signal a break with the past – to acknowledge the appalling scale of torture in Sri Lanka, and to demonstrate a genuine willingness to take the steps necessary to end its use. That opportunity was sadly not taken. Instead, and in step with its three written submissions to the Committee (in October 2015, June 2016, and November 2016), the Sri Lankan delegation yet again chose the path of denial, defence and diversion. In light of a detailed and wide-ranging discussion by the committee, often frustrated by the delegation’s apparent efforts to run down the clock on proceedings, we highlight some of the key takeaways from the meeting. The latter of these – which offers arguably the most comprehensive (if perhaps conservative) data sets – indicates that 3,404 complaints of torture were received in the period 2010-2016. By comparison, the government of Sri Lanka maintained in its November 2016 report to the Committee that ‘150 ‘incidents’ were recorded by the Department of Police in the period 2012-2016. Whilst during the session one of the Committee members highlighted the rate of torture complaints to the National Human Rights Commission as being “ten times” higher than government figures, a quick analysis of the data in fact reveals the rate of torture complaints to be over fifteen times higher across a comparable time frame. Throughout the entire two day session, the government delegation failed to engage whatsoever with questions – put repeatedly by the Committee members – about the existence of unofficial torture sites. Despite detailed and credible research confirming their use, including 29 instances recorded by the ITJP in 2015 and 2016, the government has maintained in its latest written submission that “no such camps/detention centres exist at present”. 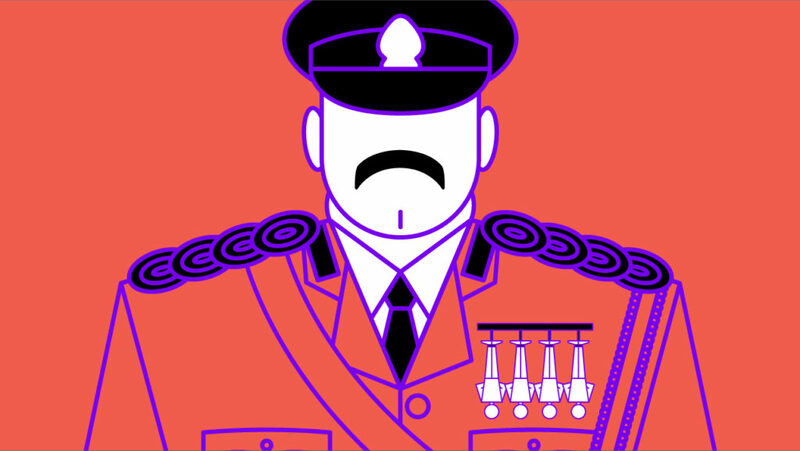 This much was clearly indicated by the government of Sri Lanka’s jaw-droppingly offensive decision to send as part of its delegation to the Committee, Mr Sirisa Mendis, the police official in charge of Sri Lanka’s most notorious torture site in the aftermath of the civil war. Mendis, who has for the past 17 months been the director of the Centre for National Intelligence at the Ministry of Defence, has a long list of allegations against his name, including numerous specific cases of torture allegedly under his command over many years. The extraordinary nature of his attendance was not lost on Committee members who took the opportunity to pose questions directly to him about his complicity in torture. He did not respond to the allegations. That such an individual remains in a position of authority in Sri Lanka, and that the government was brazen enough to send them to defend its record, accords with the extremely limited information the Committee was able to elicit about successful prosecutions against torturers. Despite repeated efforts by the Committee, this line of enquiry was repeatedly rebuffed by delegates who, rather than address issues of substance, frequently resorted to lengthy explanations of Sri Lankan case law and court procedure – missing the fact that having a legal system and upholding it are two very different things. 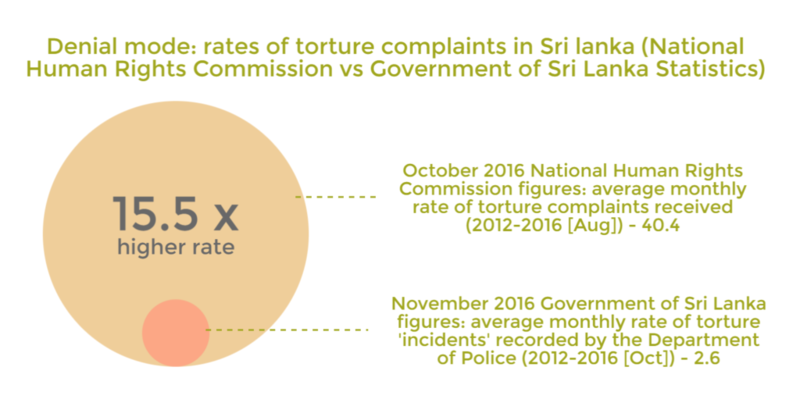 As such, observers were left to rely on the government’s November 2016 written submission to the Committee which claimed that a mere four individuals have been prosecuted to date under Sri Lanka’s Convention Against Torture Act. Even in relation to the government’s own figures on members of the security forces alleged to have been involved in torture (170), this is an astonishingly low figure. Committee members also failed to obtain a satisfactory answer as to why, on the government’s own statistics, only 17 of the 150 cases comprising those individuals had been investigated at all. Though praising several policy measures, including the improved independence of national oversight bodies under the new government, the Committee were extremely critical of the failure to deliver on reforms that would introduce basic safeguards against torture in custody. In particular, concerns were raised about the slow pace of proposed amendments to the Criminal Procedure Act, designed to provide detainees with access to legal counsel immediately after arrest, as well as in relation to the draft Counter Terrorism Act (CTA) framework, especially the apparent absence of safeguards against arbitrary arrest, the admissibility of confessions, and the broad definition of ‘terrorism’ under the draft. Given the near unanimouscondemnation of Sri Lankan civil society of the draft, the Sri Lankan delegation’s watery response – that the draft is an “evolving document” – provided scant reassurance that the government will undertake the wholesale scrapping and re-write that is required. 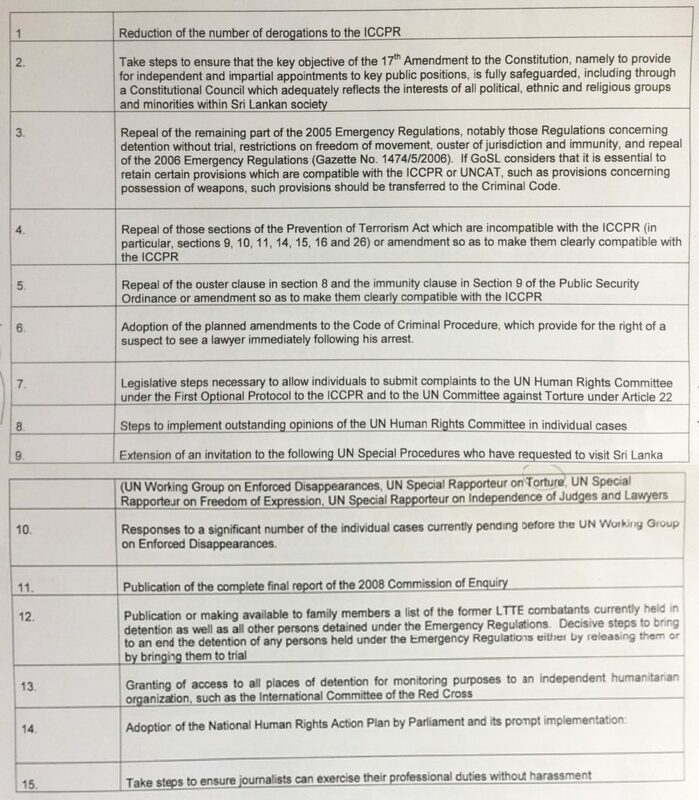 While discussions about the CTA draft drag on, Sri Lanka’s notorious Prevention of Terrorism Act (PTA) – a draconian piece of emergency war-time legislation which Amnesty International have described as “facilitat[ing] torture” – remains not only in force but in frequent use. A key area of focus for the Committee related to the widespread and systematic use sexual violence by the Sri Lankan army both at home and abroad – practices that a recent UN report, the ‘OISL’, found to be “part of an institutional policy within the security forces”. Yet despite multiple unequivocal requests for further information about the numbers of individuals prosecuted and convicted for such crimes, no figures were provided by the Sri Lankan delegation. Much emphasis was placed instead by the Sri Lankan delegation on its response to allegations of systematic sexual abuse by 134 Sri Lankan soldiers serving as part of a UN Peacekeeping Mission in Haiti in the between 2004 and 2007 (an extremely narrow response given the breadth of allegations put forward). Having failed to respond the Committee’s question about why only 23 individuals allegedly involved had been subject to “disciplinary actions” (consisting of three individuals losing their jobs and the remainder undergoing unspecified lesser punishments), government representatives went to lengths to explain additional steps taken, including the issuing of instructions to the military warning against torture, as well as the introduction of a “3-tier vetting system” to prevent soldiers with histories of sexual misconduct from participating in peacekeeping forces. Given that no publicly available information exists about these measures, nor systems in place for their scrutiny, they are claims cannot be taken at face value. The government of Sri Lanka is eager to regain the “GSP+” preferential trade status with the EU that was stripped in 2010 following human rights concerns. For its part, the European Union appears enthusiastic about restoring it as part of the ‘normalisation’ of relations with the Sirisena/Wickremesinghe administration. But given the outcome of the Committee’s review, a restoration of the GSP+ status would fly in the face of the European Union’s own rules and criteria that, among others, would require Sri Lanka to fully implement the Convention against Torture, amend the Code of Criminal Procedure, and repeal the Prevention of Terrorism Act. The fact that none of these have been satisfied has been made abundantly clear over the past few days. Unfortunately it is not just the EU who now seem willing to overlook systemic torture in Sri Lanka for the sake of normalizing diplomatic relations. British Minister of State Baroness Anelay (also Special Representative on Preventing Sexual Violence in Conflict) recently visited Sri Lanka and, to judge by her subsequent statement, made absolutely no attempt to send tough messages regarding justice, accountability and human rights. Worse still, she appeared to offer a deeply irresponsible endorsement of the Sri Lankan government’s plans to expand its peacekeeping contributions, taking at face value the government’s totally unverified claims about new vetting procedures, and further still, suggesting that the Sri Lankan army was fit to “share experience” on tackling sexual violence. At this key moment, when so much hangs in the balance with respect to Sri Lanka’s justice and reconciliation process, this simply isn’t good enough. Unless the international community makes it clear to the Sri Lankan Government that the absence of progress thus far is unacceptable, and demonstrates a willingness to use its influence to address serious abuses committed by the state, the future of Sri Lanka’s fragile peace will remain in doubt.